Liberia's Vice President Joseph N. Boakai, who is in Accra, Ghana to participate in programmes marking the 60th Anniversary of Ghana, has held talks with President Nana Addo Dankwa Akufo-Addo. A dispatch from Liberia said that during their talks in Accra, Vice President Boakai formally conveyed the best wishes of President Ellen Johnson Sirleaf, the Government and People of Liberia on the anniversary that was attended by several African Heads of State. Boakai extolled the long-standing ties between Ghana and Liberia dating back many years and wished for the people of Ghana peace and prosperity in the years ahead. He informed the President of Ghana about the democratic process that is well on course in Liberia and recounted the role that Ghana played in the restoration of peace in Liberia. Boakai sitting alongside other African Leaders at independence Square, including former Presidents of Ghana Johns Jerry Rawlings, John Kuffour, and John Mahama, described the celebrations as a milestone in the history of Ghana. Vice President Boakai, at the head of Liberian delegation, arrived in Accra on Sunday to represent President Sirleaf, the Government and people of Liberia at the 60th Independence anniversary of Ghana. 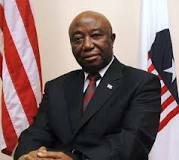 Vice President Boakai, had 10 years ago, represented Liberia at the 50th Independence Anniversary of Ghana.